This topic describes how Pivotal Cloud Foundry (PCF) users with the Space Developer role can set up and configure the App Autoscaler service in the Apps Manager UI to automatically scale apps based on rules that they set. You can use the App Autoscaler command-line interface (CLI) plugin to configure App Autoscaler rules from the command line. NOTE: Space Managers, Space Auditors, and all Org roles do not have permission to use App Autoscaler. For help managing user roles, see Managing User Accounts and Permissions Using the Apps Manager. App Autoscaler is a marketplace service that helps control the cost of running apps while maintaining app performance. Breaking Change: App Autoscaler relies on API endpoints from Loggregator’s Log Cache. If you disable Log Cache, App Autoscaler will fail. For more information about Log Cache, see Loggregator Introduces Log Cache. Create an instance of the service. Bind the service to an app. In Apps Manager, select an app from the space in which you created the App Autoscaler service. Under Processes and Instances, enable Autoscaling. 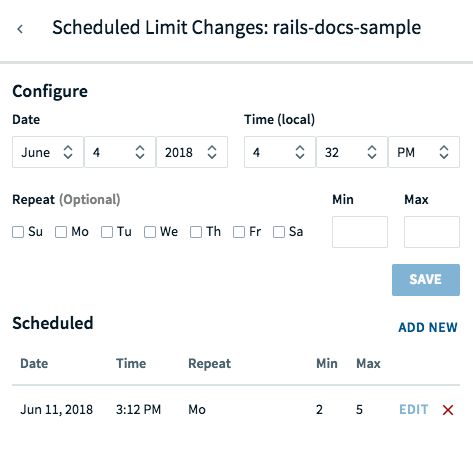 Click Manage Autoscaling to configure instance limits, scaling rules, and scheduled limit changes for the app. 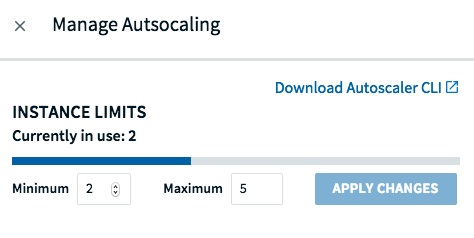 If you manually scale an app bound to an App Autoscaler service instance, the App Autoscaler instance automatically unbinds from that app, and the app scales to the manual setting. App Autoscaler keeps instance counts within an allowable range defined by minimum and maximum values, or instance limits. Note: You can also schedule changes to your instance limits for a specific date and time. In Apps Manager, navigate to the Overview page for your app and click Manage Autoscaling under Processes and Instances. In the INSTANCE LIMITS section, set values for Minimum and Maximum. To keep your apps available without wasting resources, App Autoscaler increments or decrements instance counts based on how current metrics compare with configurable minimum and maximum thresholds. CPU Utilization Average CPU percentage for all instances of the app. Container Memory Utilization Average memory percentage for all instances of the app. HTTP Throughput Total HTTP requests per second (divided by the total number of app instances). HTTP Latency Average latency of apps response to HTTP requests. This does not include Gorouter processing time or other network latency. Average is calculated on the middle 99% or middle 95% of all HTTP requests. RabbitMQ Depth The queue length of the specified queue. Custom Users can configure their apps to emit custom metrics out of the Loggregator Firehose. For steps on how to set up your apps to emit custom metrics, refer to the Metrics Forwarder Documentation. Compare One custom metric divided by another. When you add a rule, the Metric field is the dividend and the Comparison Metric field is the divisor. 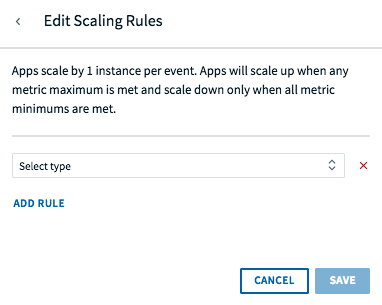 In the Manage Autoscaling pane, click EDIT next to SCALING RULES. The Edit Scaling Rules pane appears. In the Select type dropdown, select the metric for the new scaling rule. Set the minimum and maximum thresholds for the metric using the table in the Scaling Rule Metrics section above as a guide. If you are adding an HTTP Latency rule, configure Percent of traffic to apply. If you are adding a RabbitMQ depth rule, provide the name of the queue to measure. If you are adding a Custom rule, enter your custom Metric. If you are adding a Compare rule, enter values in the Metric and Comparison Metric fields. Click the × icon next to the rule you want to delete. 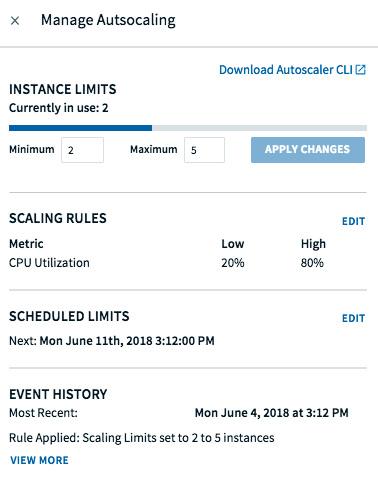 Because app demand often follows a weekly, daily, or hourly schedule, you can schedule App Autoscaler to change the allowable instance range to track expected surges or quiet periods. Click EDIT next to SCHEDULED LIMITS. Click ADD NEW to add a new scheduled limit or select an existing entry to modify by clicking EDIT next to the entry. Date and Time (local): Set the date and time of the change. Repeat (Optional): Set the day of the week for which you want to repeat the change. Min and Max: Set the allowable range within which App Autoscaler can change the instance count for an app. To delete an existing entry, click the x icon next to the entry you want to delete. App Autoscaler logs all autoscaling events. To view all autoscaling events in the past 24 hours, click VIEW MORE in the Event History section of the Manage Autoscaling pane. 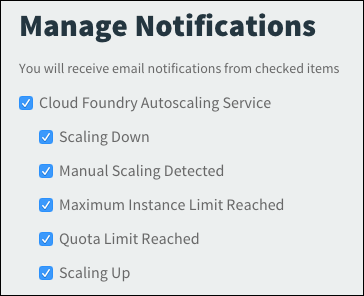 Autoscaler emails or texts its event notifications to all space users by default. Navigate to the Manage Notifications page of PCF. Note: If installed, Notifications Management should be available at https://notifications-ui.YOUR-SYSTEM-DOMAIN/preferences.